"50-gallon tank is an acrylic aquarium and our top choice for a saltwater aquarium...17 times stronger than glass, and more transparent." "Adjustable LED light expands in size to accommodate tank size and provides bright, efficient light...and blue light for night." "Removes organic compounds from the tank environment and holds them in a collection cup, ready to be disposed of." "Offers mechanical, chemical, and biological filtering to give you a three-step cleaning process." "Can be positioned anywhere in the tank to provide efficient water movement...can be adjusted to point in a variety of directions." "Plenty of porous openings, outstanding price point and value...no need to cure this rock—it’s ready for use right away." "Aragonite substrate has a slightly larger grain...after it settles down, it doesn’t blow around or cloud the water." "Will give you the right balance of elements to transform your freshwater into saltwater in no time, nitrate and phosphate-free." "A simple device that can tell you the aquarium’s salt level and specific gravity." "Uses suction cups...has an adjustable dial to set the temperature that is right for your tank...the entire unit is fully submersible." "A digital thermometer with a probe...features an easy-to-read display, temperature readings in degrees Fahrenheit or Celsius." "Tests pH, ammonia, nitrate and nitrite levels...includes testing solutions, glass test tubes, and a color card for reading results." Selecting the right tank for your saltwater aquarium is the first step you’ll need to take in your new hobby. There are many different size aquariums, but smaller saltwater tanks can sometimes be tough to keep in balance. A tank of at least 20 gallons is a good size to start with, but the bigger the tank the more you’ll be able to enjoy looking at inside! This 50-gallon tank from SeaClear is an acrylic aquarium and our top choice for a saltwater aquarium. This sturdy tank is 17 times stronger than glass, and acrylic is also more transparent than glass —enhancing the visibility and beauty of your tank. The SeaClear tank comes with a lid and light, though many hobbyists have found the light to be a little underpowered. Swapping it out for a more efficient LED light is an easy task. Overall, the SeaClear tank is a great choice for your first saltwater aquarium. Light is important to a healthy saltwater ecosystem, and there are a variety of lighting options available for your tank. Florescent lights typically make up the majority entry-level lighting available, but newer LED lights that offer energy efficiency have been expanding in the market. For highly-beneficial Coraline algae to grow, you’ll need sufficient lighting in your saltwater tank. If you have a fish-only tank, you won’t need to worry as much about the light provided — except for when you want to take a peek into the tank yourself! One of the top lights available for your saltwater tank is the NICREW Aquarium Adjustable LED Light. This light expands in size to accommodate different size tanks and provides bright, efficient LED light — including blue light for nighttime use. Users love the simplicity of the light combined with the affordability for an LED light. However, note that this light is not made to sit directly over the open water. You’ll need to use it over a glass aquarium cover or acrylic top. Using a protein skimmer in your saltwater aquarium will make a big difference in the health of your tank environment. The protein skimmer removes organic compounds from the tank environment and holds them in a collection cup, ready to be disposed of. If organic compounds are allowed to build up in the tank, an overabundance of nitrates can occur — leading to an unhealthy and even toxic aquarium. The Bubble Magus Curve 5 Protein Skimmer is a top choice among aquarium enthusiasts for its quiet and efficient operation. Many users note that during the break-in period adjustments may be needed, but once this initial phase is over the pump surpasses the cleaning abilities of many other protein skimmers. Filtration is a multi-faced operation in a saltwater aquarium. One of the key pieces you’ll need is a power filter. This filter is used to keep the water in your saltwater tank free of impurities and debris — usually fish food remnants and waste. Similar to a protein skimmer, a filter will remove this debris from the tank to keep ammonia and nitrate levels in check. The Penguin Power Filter from MarineLand offers mechanical, chemical, and biological filtering to give you a three-step cleaning process. The Penguin Power Filter has a BioWheel that grows beneficial bacteria for biological filtration, while the replaceable cartridge inside the unit provides mechanical and chemical filtration. Aquarians love the reliability of MarineLand products and the efficient cleaning and filtration offered by the Penguin Power Filter. Powerheads assist in creating water movement within your tank. They are adjustable and can be positioned to assist in moving water through filtration systems or to replicate natural ocean swells. The Hydor Koralia Nano Aquarium Circulation Pump is a great choice for a powerhead that can be positioned anywhere in the tank to provide efficient water movement. Users of this circulation pump like that the pump can be adjusted to point in a variety of directions, and they note that the outside magnet that holds the pump in place is very strong. However, a few people noted that for larger tanks (usually 30 gallons or more) you may need more than one powerhead, depending on your objectives. Rock in your saltwater aquarium will add visual appeal to the tank but is also important for creating sleeping and hiding spots for the residents of your tank. Live rock refers to rock that is growing algae. As mentioned earlier, coraline algae is one of the most common algae grown in a saltwater tank. To create a home for the algae, you’ll want to place several pieces of dry rock in your tank and introduce algae to the environment (purchased from a pet store or obtained from a friend). The South Sea Base Rock from Carib Sea makes an excellent choice when setting up your saltwater aquarium. It has plenty of porous openings and many tank enthusiasts comment on the outstanding price point and value of this rock. You also don’t need to cure this rock — it’s ready for use right away. Choosing a substrate for your saltwater tank is important since it provides the base layer for your tank. Substrates contribute greatly to the overall well-being and balance of the tank’s ecosystem. Popular substrate choices include live sand, aragonite, crushed coral and shell. Basically, you’ll want to pick a substrate that is from the ocean floor – not from land. Beach sand or fish tank pebbles are a no-go for your saltwater tank! This aragonite substrate from CaribSea is an easy choice for a saltwater aquarium. It has a slightly larger grain and many users like the fact that after it settles down, it doesn’t blow around or cloud the water as much as some other substrates. If you’re going to have a saltwater aquarium, then you need salt! As you may have guessed, not just any kind of salt will do. You’ll need a specially-formulated mixture that will transform your freshwater into saltwater in no time. The Instant Ocean Sea Salt mix is a popular choice for a product that will give you the right balance of elements and is also nitrate and phosphate-free. Users comment on the health and vitality of their tank when using this salt mix to prepare their tank’s water. As with any sea salt mixture, however, you will need to mix carefully before adding it into your tank. To sustain life in your saltwater tank, you’ll need to regularly test the salinity level of the water. If the level of salt becomes too high or too low, the fish and plant life in your tank may die. An easy tool to measure salinity is the hydrometer. The Instant Ocean SeaTest Hydrometer is a simple device that can tell you the aquarium’s salt level and specific gravity. While a few users had issues with the accuracy of this gauge, many commented that it worked great if you made sure to clean the hydrometer with tap water and dry it after testing to remove any residual salt. 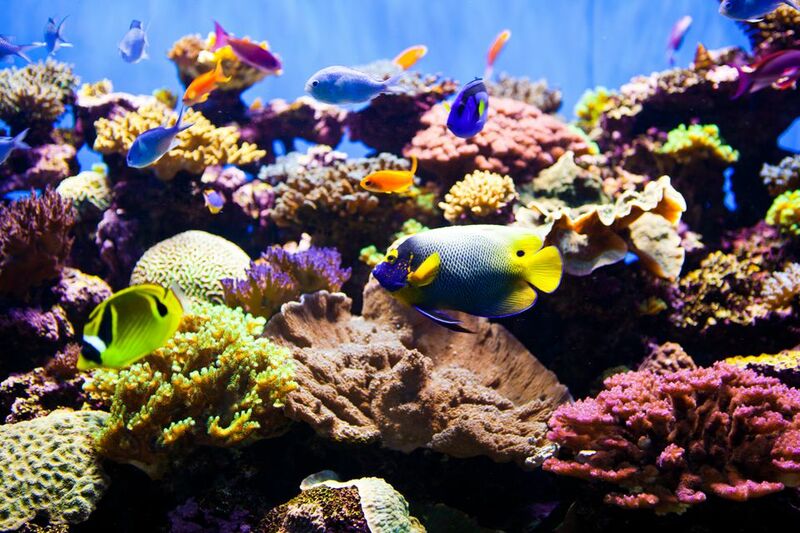 Saltwater aquariums are typically home to tropical fish and plants, so you’ll need to keep the water temperatures warm enough for these organisms to thrive. A heater can regulate the water temperature and maintain a consistent environment. Some heaters are preset to 78 degrees, while others are adjustable. The Aqueon Pro Heater is a popular choice for an in-tank heater that uses suction cups to hang on the side of the aquarium. It has an adjustable dial to set the temperature that is right for your tank, and the entire unit is fully submersible. As mentioned above, maintaining the right temperature in your saltwater aquarium is important. A thermometer will give you instant and accurate readings on the temperature inside the tank — and alert you to any problems with your heater. There are a variety of saltwater tank thermometers available, but one of the most popular types is an in-tank probe thermometer. The RisePro Digital Water Thermometer is a digital thermometer with a probe that rests in the water of your tank. The unit features an easy-to-read display, provides temperature readings in degrees Fahrenheit or Celsius, and is accurate to one degree. This thermometer also has a power off option to conserve battery life, which is something that not all digital thermometers at this affordable price point offer. As you have learned, a saltwater aquarium requires just the right balance of elements to maintain a healthy environment. To the casual observer, the water may look clean — but only a testing kit can tell you if your tank environment is in balance. Testing kits will provide you with the chemicals, strips, and guides necessary to accurately test your saltwater. The API Saltwater Master Test Kit is a popular choice for testing high pH, ammonia, nitrate and nitrite levels in your aquarium. It includes six bottles of testing solution, four glass test tubes and a color card for reading results. Users find the value and convenience of this testing kit to be exceptional and it’s a great choice for keeping an eye on the basic health of your aquarium.